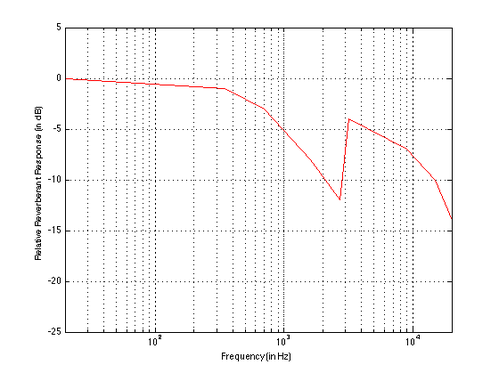 The direct sound is linked to the on-axis response of the loudspeaker and must be as flat as possible to preserve the encoded musical message. The reflections depend on the loudspeaker off-axis radiation pattern & room configuration. These reflections have a strong influence on our listening experience as they represent most of the energy sent to our ears. If they appear separated from the direct sound on a measurement, we don’t hear them as a different event but rather as timbre alterations. This is the first reason why the reverberated sound must be balanced to preserve the timbre of the reproduced music. The second reason is linked to distance perception: a complex processing of sound reflections is done by our brain to evaluate distances. Without reflections we are not able to evaluate the relative distance of a sound source. 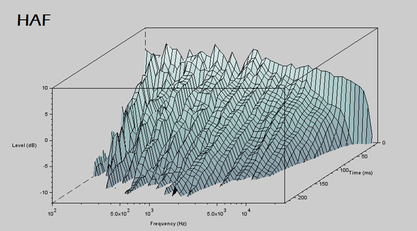 If there is a deviation in this ratio for some frequencies, the distance perception will be fooled and the spatial information encoded in the stereo recording will be overridden. On the other hand if the ratio requirement is fulfilled the loudspeaker & room will tend to disappear and the sonic illusion will be there. The issue in loudspeaker design is that the on & off-axis responses are locked together and we can’t change one w/o changing the other. Let’s take the example of a 2 way loudspeaker: the on-axis response can be made perfectly flat thanks to optimized passive or active cross-overs. On the other hand the off-axis response will depend on the radiation pattern of each driver and of their acoustical summing in the cross over region. 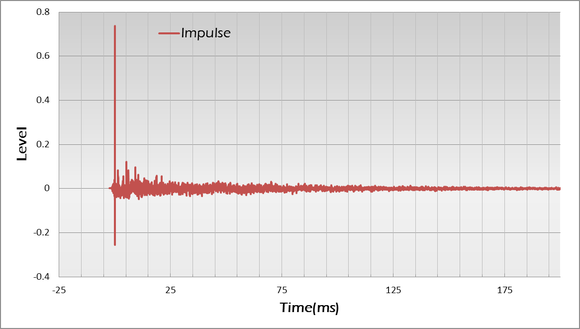 This can be controlled up to a certain extend by the choice of components but not to the point of fully mastering the off-axis response. 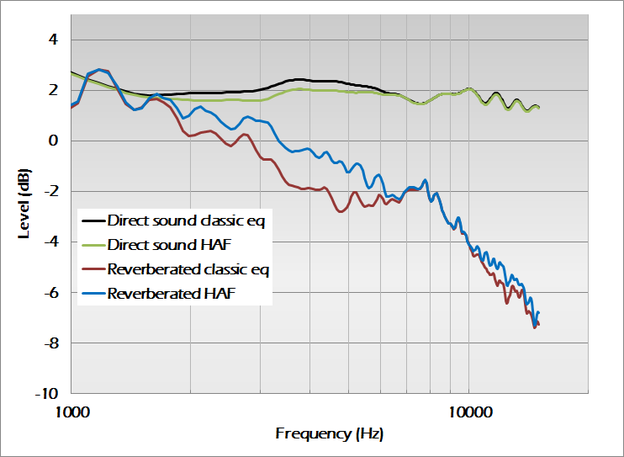 Standard equalization methods are based on filters that only change the direct sound, so the only choice left to the designer is either a flat on-axis response or a smooth power response: both will sound differently but none will fulfill the 2 critical requirements exposed before. Our specific signal processing procedure unlocks this constraint and allows a separate control of the direct & reverberated sound. It can be easily seen that the classic equalization method “compensate” the lack of energy in the reverberant field by modifying the direct sound but the reverberated one will stay uneven. With our procedure, the direct sound is protected and the reverberated sound is much more “balanced”. 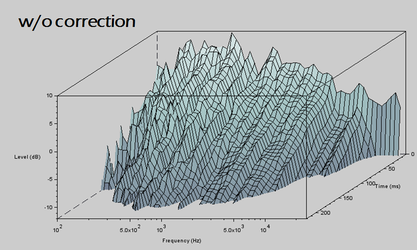 Listening to the results is like switching between 2D & 3D representation of the same audio material. 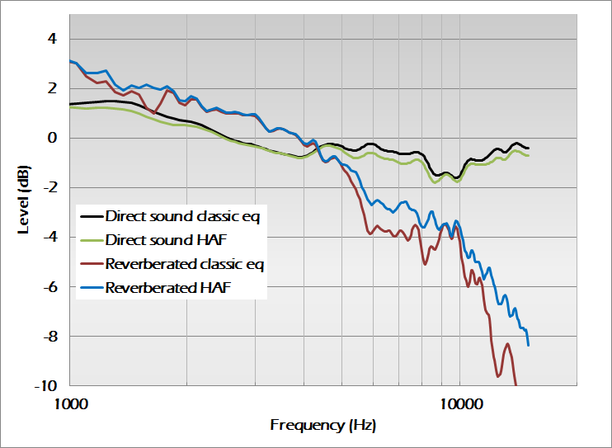 Our equalization method provides a fully balanced sound thanks to the optimization of the direct & reverberated sound. 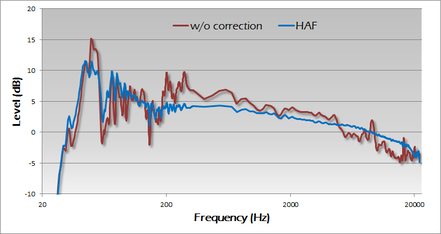 A final step based on multi points measurements ensure a full tonal correction especially in the lower end where the room modes are problematic. The quest of almost perfect pulse is managed with specific phase correction procedures that guarantee a minimal level of pre ringing. 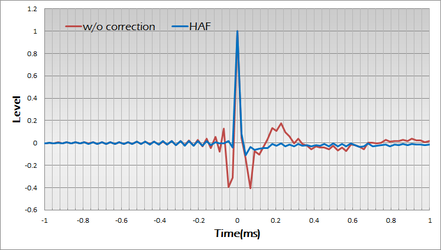 Better phase coherence on the whole spectrum protect timing from the original signal. Great imaging comes naturally from the previous steps: improved timing through phase corrections, neutral direct sound & balanced reverberated sound. We optionally include cross talk cancellation filters to further improve the soundstage especially for recordings made with dummy head but as well the vast majority of stereo "natural" recordings.